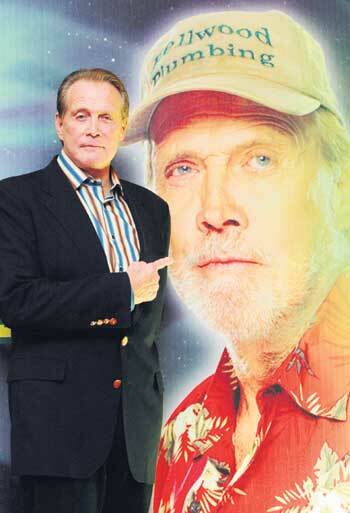 He is friendly, charming and witty, says SHUIB TAIB of Lee Majors, who ironically, finds the series that made him famous boring. In Kuala Lumpur recently to promote his latest movie, Ben 10: Race Against Time, the former actor of The Six Million Dollar Man (TSMDM) plays Grandpa Max in the movie. It’s a made-for-TV action movie based on the hit animated action-adventure series, Ben 10. It tells the story of Ben Tennyson, who with the flick of a powerful alien wristwatch called The Omnitrix, can turn into 10 different aliens with amazing superpowers. Majors was in a cheery mood. During the two-to-one session, before we could say Steve Austin, he turned things around and fired questions to us instead. “How old are you? 43? You look 16! Are you married? Got a girlfriend? What's wrong with you guys over here? You gotta get out more often. All right, what do you want to know that I can lie about?" he said, much to our amusement. Majors, 69, is probably not as “bionic" as he once was but don’t let that fool you. If anything, his humour is still fresh and young. Asked what he had been up to, he replied, “You mean last night? Have you seen my wife? How’s that for a start?,” he smiled. Indeed, his wife Faith Majors was also here. And boy, did she look stunning! Far from slowing down, Majors has been keeping himself busy, working on several different projects. “I’ve been doing a lot of small budget, independent films. In fact, I turned on the telly yesterday and there was one on, in the morning. Then I turned it on again in the afternoon and the same movie was playing again. “It was a film I did about three years ago. Some of them you don’t know what ever happens to them because some of them don’t come out on the big theatre. Most of those go straight to DVD, so I’ve been doing a lot of those. I’ve also been doing a few commercials. I was in Germany recently to do a Honda commercial,” explained Majors in his Southern accent. As pop icon, Majors might have been portrayed as being a serious professional. But deep down, he loves a good laugh. “I just finished a three-episode series called Weeds. I play the minute-man, like a border patrol. It’s a comedy show, very funny. I also do a recurring role on a series called The Game. It's about American football. It revolves around the players’ wives and girlfriends. It’s like a soap opera. Between that and the independent film, I just finished Conflict of Interest with Michael Madsen. But who knows what will happen to it." Majors tells us the difference of being here now and when he was here in the ‘70s with a handful of celebrities for a tennis tournament. “I came here when the show (TSMDM) was popular. I played in a tennis tournament. We were shooting The Love Boat in Beijing, China. I had just finished work when I got a call from a guy called Oscar Goldman (who played his boss in TSMDM). “He said, we’re playing celebrity tennis here and in Singapore and asked me if I would come. We were a group of six. Then I went to lunch with a Sultan in a white mansion. I remember visiting the Royal Selangor Pewter too. Of course they gave me factory price and I ended up with a whole bunch of pewter. I still have got some of that. “The biggest change in Kuala Lumpur, well, the Twin Towers were not here. And I didn’t stay in anything this nice,” said Majors of the Mandarin Oriental Kuala Lumpur. Aside from playing grandpa Max in Ben 10 : Race Against Time, Majors had appeared in a host of TV sitcoms. “I’ve guest-starred in a lot of shows like According To Jim where I played God. In the show I changed Jim’s life around. I also appeared in Will & Grace. I do a lot of these shows,” said Majors adding that, contrary to popular belief, TSMDM was not his greatest experience although it might have propelled his name worldwide. “The Big Valley was the most fun at the time because it was my first and I love Westerns. All the action, horse-back riding, I really loved it. TSMDM was so hard and so boring for me. Ironically that was the most popular. It was total work. You’re there (at the set) 16 to 17 hours a day,” he recalled. When asked about Bionic Woman (the movie), Majors was spontaneous. “It was terrible. I hated it. It was so dark, over-the-top, too much violence and explosions. She was swinging on wires and kicking butts and she was not likeable. She had a scar on her face and there was nothing to like about her,” said Majors. However, Majors was all praise for his co-star in Ben 10 : Race Against Time, child actor, Graham Philips. “Before I met him, I watched Evan Almighty with my wife and I said to her, “you know that kid (Philips) would be great for Ben 10.” Then I got to the set about two weeks later and the kid was there. “I thought this is really cool. This is going to be good. When you go in and you know you’re going to work with a 13-year-old, you don't have to do anything. He’s had some pretty good experience but it was not the case with the other kid, Haley Ramm as she hasn’t had as much experience,” said Majors. “The Press is terrible now. The paparazzi is all over you. I wouldn’t want to be starting out now. Back then, for example, when you talk about the old stars, there was always a little mystery about them. You never knew whether they went out or not because there was no paparazzi and no Internet. Majors also pointed out that actors today don’t do much on the set. * Ben 10 : Race Against Time premieres Sept 26 at 7.30pm on Cartoon Network with repeats on Sept 27 (6pm) and Sept 28 (11am).